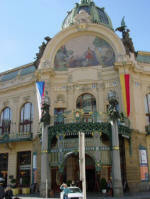 Prague, the beautiful capital of the Czech Republic remains one of the most popular destinations for students to participate in educational programs. Upon arrival, students will participate in an orientation session which includes a tour of Prague’s most famous sites: Prague Golden City tour including Old Town Square, Astronomical Clock, Charles Bridge, Mala Strana, the Prague Castle, the Gothic Cathedrals and Castle Gardens, Old Synagogue in the Jewish Quarter, Vltava River, Prague Library, Loreto Church, and Alfons Mucha’s home. ESAC will provide Prague public transportation pass for the duration of the program so that students can revisit these and many other locations on their own. Prague is the heart of the Czech Republic and it is the political, economic and cultural center of the state. The president, government and parliament residences are located here. Prague is the center of academic and vocational education, the seat of the Academy of Sciences and of a number of other research and scientific institutes. It is a significant European cultural center, which includes a number of theaters, museums, galleries and exhibition halls. Prague contains an extremely large number of significant architectural buildings dating from all periods. The historic town center has been included in the UNESCO World Cultural and Scientific Heritage list since 1992. Prague is also one of nine cities, which were awarded the title of “European metropolis of culture in 2000” by the European Union. Prague Castle is one of the most popular sights visited in Prague. Take a stroll across Charles Bridge and make your way up the winding streets until you reach the largest ancient castle in the world. Constructed in the 9th century, Prague Castle has had four major reconstructions, but it keeps its classical facelift it took on in the 18 century during the reign of Maria Theresa. On your way up, be sure to stop off in some of the hidden gardens called zahrady, and have a coffee in one of the small cafes. The Lesser Town, founded in 1257, this section of Prague is a favorite for tourists. The small streets are spotted with wonderful gardens and cafes, a perfect area to spend an afternoon. Prague’s Jewish Quarter lies at the base of Charles Bridge. It is just minutes away from the Vltava River; from the base of Charles bridge, turn left and walk past the Charles University Philosophy faculty until you reach the Old Jewish Cemetery. Many Jewish died during the WWII or were forced by the Communist regime to leave the country. There are two prominent figures synonymous with this part of the city, Franz Kafka (1883 – 1924) and the mystical humunculus Golem created by Jehuda ben Bezalel, also known as Rabi Löw. 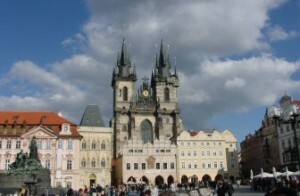 Although this area is called Old Town, it boasts some of Prague’s most modern and most expensive shops and restaurants. From the Powder Gate, take Celetna Street into the Old Town Square. On the square you will find a host of traditional hand made Czech souvenirs and some of Prague’s best ice cream stands! The modern version of Prague lies in New Town. For young people, this is the area for exciting nightlife, including numerous casinos. Here you can find excellent shopping, pubs, and restaurants.